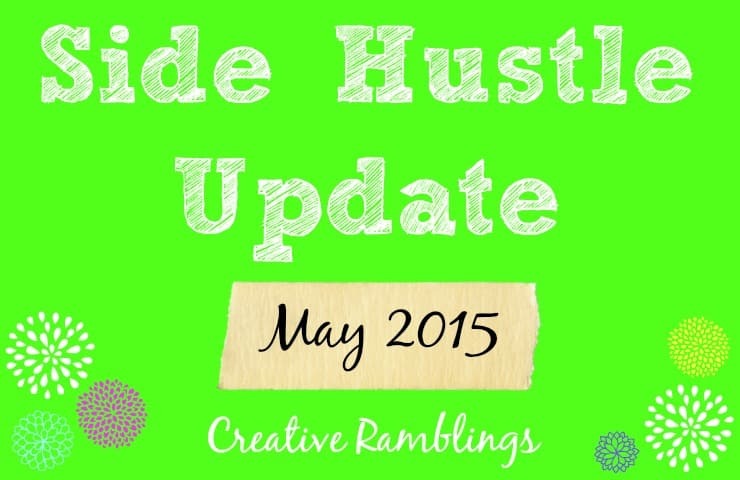 It’s June which means it’s time for my May Side Hustle Update. You can read in my March update, the first one I shared, more about why I am doing this and why I chose to be a little more vague about my numbers. This post is for bloggers and small business owners looking for a little encouragement. You can succeed, you can make money, heck you can even support your family with a side hustle! Read on friends. I have 2 Side Hustles at the moment. Be sure to read Why You Need to Get Yourself a Side Hustle if you are not familiar with this term. These are income sources outside of my full-time job as a Stay at Home Mom. Below you will find an update on both my Etsy shop and this blog. Something new this month, my husband and I are actively using 2 sites to help save on online shopping; Ebates and Raise. Ebates is a portal that,when you start your shopping trip on their site, you earn cash back. The cash back amount varies from store to store and with holidays, events, and sales. Raise is a site to buy and sell gift cards. We have purchased a couple of gift cards anywhere from 5% – 9% off the face value. These can be e-gift cards or physical. To sweeten the deal we use our best cash back rewards credit card to buy the gift card, then go through Ebates to make the purchase. You see how this can add up? Once we got the hang of both sites, it’s just a few extra clicks to earn some cash. Purpose: To create and sell handmade paper creations for parties and celebrations. I have always been a passionate paper crafter and this is my creative outlet. Paid Promotion: I continued using promoted listings in May and saw some revenue from it. What I am focusing on next month: Since my fun little bee tags are my biggest seller I am working on new variations to appeal to a larger audience. Purpose: To share my thrifty creative journey along with tips for simple living. Read more here. I also received 2 furniture items and some product to use in a post. Despite being a slower month I did see an increase in my income, so far I have seen an increase every month this year. I track my income and expenses using this spreadsheet. I tally income as I am paid, my income for May was generated in April and paid within 30 days. Below is a list of the companies I use to monetize my blog. The links noted with an * are affiliate links. You can view my full disclosure policy here. Some of these companies I am registered with and have never done a paying campaign, others are regular favorites. I find it beneficial to join communities as I am able, you never know when the right campaign may come along. What I focused on in May: I stuck to a pre-planned social media calendar focusing on Facebook and Twitter. I also kept up pinning old posts through Boarbooster and fabulous network content through Ahalogy. I saw a steady increase in followers across all social media channels and a drastic increase in engagement on Facebook. This did translate to a few more blog clicks from Facebook. My takeaway? Keep up with a social media calendar. As my following grows I will see more visitors coming to my blog. Focus for June: Now that I have a social media plan in place I want to increase my email subscriber list. To do this I am developing a freebie for my subscribers and working with SumoMe to generate new sign ups. I am also starting a new video series on YouTube. I am trying just a video without an accompanying blog post, and lots of social media promotion. This update keeps me on track and I hope offers you something tangible that you can use to help grow your business.